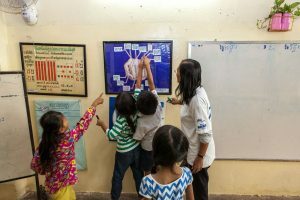 With more than one million Cambodians living and working in Thailand – many of them being undocumented – and the recent Thai immigration law reinforcement leading to massive deportation, our work at the border is crucial to help migrant children and families access their rights and get new opportunities for their future. To reinforce our activities and be able to respond to the growing number of children in need, we ran a fundraising appeal in June, and we are extremely grateful to all of our supporters who have donated, shared the campaign and spread the word on social media! Thanks to your amazing support, we have raised $8,747! This means being able to help more deported children to return to their families in Cambodia, support marginalized kids to get school material but also caretakers to find a job or youth to enroll in our vocational training. Bopha* dropped out of school at 8 years old when she migrated to Thailand with her parents and grandmother. In Poipet area – her home town – jobs are scarce and her parents could not make ends meet so they decided to try their luck in Thailand, just across the border. After 3 years working illegally as construction workers in Thailand, Bopha’s parents got arrested at their workplace and were deported, without seeing their children one last time. Bopha was left behind with her younger sister and grandmother, forced to beg to survive. A few months later, it was the girls and their grandmother’s turn to be arrested by the police. They were placed in a Government center awaiting deportation. 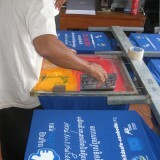 The three of them were deported back to Cambodia on the 4th June. When they were found at the border, our 3PC partners** in Poipet took care of them, helping them to find and reintegrate to their family. We have then immediately organized school enrolment for Bopha and her sister, providing all school materials. Both girls are now going back to school and our Futures Office is currently working with their parents to help them find a job. This is one happy story and there are many others because of supporters like you! In the coming months, these funds will also allow us to work more specifically on school enrolment for the new academic year, and on child labor awareness in the communities living near the border to help caretakers to find alternative income generation solutions and create a better environment for their children. 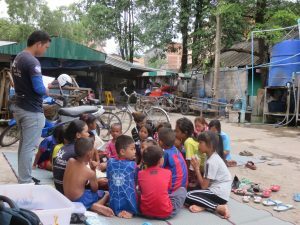 **3PC (the Partnership Program for the Protection of Children) is a Cambodian child protection program powered by Friends-International in collaboration with UNICEF and the Cambodian Ministry of Social Affairs, Veterans and Youth Rehabilitation (MoSVY). At Poipet border, 3PC is working together with Damnok Toek to respond to immediate needs of deported migrant children, ensure they are safe and refer the cases to other programs like Friends-International for follow-up and sustainable reintegration.